Haven't drawn these before, they have just come into season, delicious and way more fun to draw rambutans. Thanks for your comments everyone! I'll reply when I get the chance!! 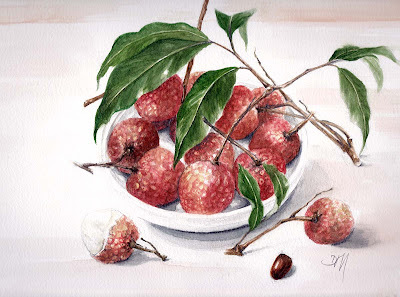 Lychees are just my favorites, fantastic painting...the shadows are just perfect ! I love lychees too. I cant believe this is the first time you've drawn them - beautiful colours! !